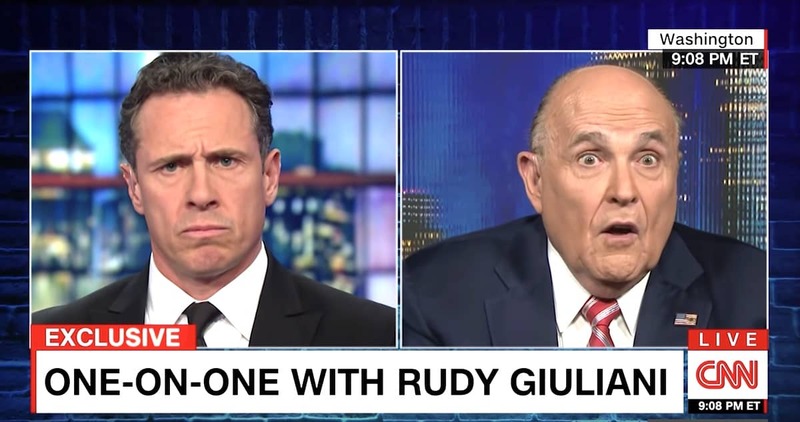 In a wild, bug-eyed interview with CNN’s Chris Cuomo, Trump lawyer Rudy Giuliani claimed he never said there was no collusion between the Trump campaign and Russia. And many are speculating that Rudy’s meltdown is merely signaling that Trump is preparing to throw Donald Jr. or Jared Kushner under the bus on Russia collusion. On Wednesday, Vanity Fair‘s Gabriel Sherman reported that sources close to Giuliani told him that “Rudy thinks it will be soon” that Special Counsel Robert Mueller’s report will be delivered, and that it will be “horrific” for Trump. Moreover, Giuliani is “very worried about the report” and now “hates” working for Trump.